Cathy Tomm Quilts: Quilt Show - Great ! What a great Quilt Show. I had fun. The Quilts were great. I forgot to take my camera and get a few photos. Sorry. 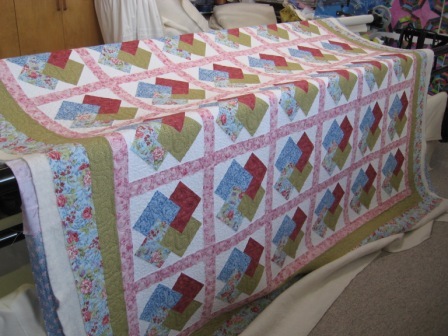 However this quilt is one I did for a customer, Carolynn, she had it in the quilt show. She was on the committee so I thought I would show hers off today. Here is a close up. I did a free motion curly thing in the card trick block. The sashing had a wave with a crescent moon at each dip. 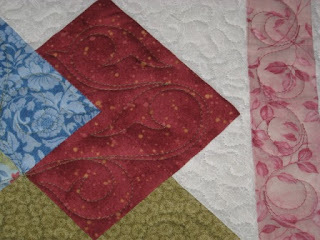 The boarder is not pictured but it had vein like quilting that matched with the block well. We also chose stippling for the background of the block. I was really pleased with this quilt. Carolyns workmanship was so good it made my job very easy. I am lucky to get so many well done quilt tops. I think this week I will work on posting more of the quilts I did in the show. I have a small group you have not seen yet, unless you were at the show. The Edmonton Guild has their year end dinner on Wed night. I promise to take my camera. I think some of the winning quilts are to be at the dinner and the challenge quilts. PS my Blue Days of Summer Quilt made it home on Friday afternoon. I was able to hang the quilt at my booth this weekend. It was a lovely show Cathy- my friend Carolyn and I had fun visiting the market mall, stopping to watch a demonstration and of course, viewing the quilts. I came home with some new treasures to play with- I wish that I had taken a camera too because there were some fantastic quilts. I was at the show on the weekend and wanted you to know that I checked out your quilting on some of the quilt in the show. Your quilting is absolutely beautiful! I know follow your blog and plan to send you my next quilt when I am finished! I am from the Medicine Hat area not sure if you remember me. Also thanks for letting me take the picture of your quilt. It is now my screen saver!